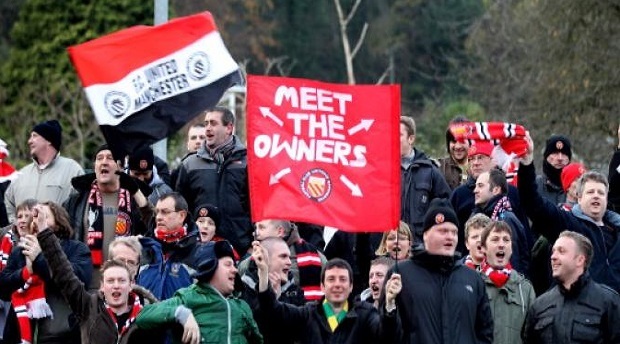 Fans of FC United, a supported-owned club founded in 2005 to protest the takeover of Manchester United by American businessman Malcolm Glazer. FC United were promoted this year to the sixth tier of English football for the 2015-2016 season. Fans today are speaking out more about actions that take place off the field of play as well as on it. Ben Shave works at Supporters Direct Europe, an organisation that helps football fans gain influence in the running and ownership of clubs. Shave is also on the Expert Advisory Panel of the Corruption in Sport Initiative and sat down with Transparency International to discuss the benefits of fans having a say in the governance of football clubs. TI: In an era where it seems football clubs have become the playthings of the very rich, what role can supporters play in ensuring clubs are run well and adhere to good governance standards? Ben Shave: Not every fan is going to be interested in what goes on off the pitch but our message is that they should be able to have a say if they want because clubs are run for the supporters. Clubs are not for the benefit of one person or a small group of people; they are there for the thousands of supporters. Progressive clubs acknowledge the role of transparency and believe that good governance is more than just a phrase. They understand that everything flows from the governance structure and fans can have an important role to play in this. The 2013 Champions League final was a great example of this – Bayern Munich against Borussia Dortmund: two very successful clubs (in sporting and financial terms) where the members’ meeting is the highest decision-making body. TI: What should fans do if they want to become involved in the fight against corruption in sport? How can they speak up? BS: A growing number of groups we work with are taking an interest in the fight against corruption – after all, problems such as match fixing have a direct impact on the game we all love. Collective, pan-European campaigns that aim to tackle problems such as racism and homophobia are already well-established, and there’s certainly potential for similar efforts when it comes to tackling corruption. Watch this space! TI: Is the relationship between clubs and fans the same across Europe? BS Fan culture is very different from country to country and from club to club. There are however binding issues: we believe that fans want clubs to have a commitment to democratic structures, sustainability and community involvement with strong social values. In Germany and Sweden, for example, clubs are member run and the challenge there is improving the governance. In places such as France and the UK, it’s a matter of fans getting a seat at the table. In Eastern Europe the issues for some fans is often how to involve clubs in stopping violence and discrimination. We are now making good progress in helping Italian supporters organise too, though when we started in 2009 we were told that it would be hopeless. The first 100 per cent fan-owned club is Cava United near Naples. There is now a national organisation for supporters that has 20 members in the Italian league right up to the Serie A. We like to think if it could happen in Italy it can happen anywhere! TI: Do fans worry about match-fixing and what can they do about it? BS: In the last 18 months to two years there has been a lot more about match-fixing and there has also been a response from UEFA, the clubs, leagues and a coordinated approach from the players union. Everyone acknowledged that something must be done. And we see positive progress. We believe that supporters should be involved in the debate too. It goes back to how the clubs are run. For example, the supporters need to know that the players are being paid because these are the kinds of situations that make players vulnerable to match-fixers. This is a matter of good governance. We’ve seen leagues fall apart because of match-fixing. In Asia some leagues were endemically corrupt and the fans gave up going to matches. Our role is to lend backing to the kind of education initiatives that were put forward by groups like Transparency International with its Staying on Side project and the FIFPro intitiative Don’t Fix It. Because fans are such an important component in sport it is only right that they should have a say in how sport and sporting mega-events are run, and what type of legacies they leave. TI: What role can fans play in mega sporting events? BS: A group like Supporters Direct Europe is a collective initiative — a civil society organisation — and we can form alliances with other groups to make sure that fans are heard during important debates. For example, we are part of the Sports and Rights Alliance along with seven other organisations including Amnesty International, Football Supporters Europe and Transparency International Germany. The goal is to push for better conditions both on and off the pitch and that includes the human rights of the workers who are building the stadiums and efforts to ensure there are anti-corruption programmes in place in large sporting events. For more on the role of supporters in strengthening governance read our article.